Just a reminder to update your bookmarks and subscriptions with my new website: www.elizabethfuss.com. Lots of pretty pics over there. Along with some other stuff. Come on over! Hey folks. I'm back. Sort of. I've moved over to Wordpress at www.elizabethfuss.com. Please come check it out. You can see my blog, plus recipes, plus links to my other writing and even my resume. Exciting, right? Let me know what you think, k? Hey guys. I'm taking a break from blogging for a while. If something comes up that I can't resist, I might post something. But I'm in the midst of a huge creative block and need to remove some of the pressure, so no blogging for me until I have something worthwhile to say. In the meantime, if you need to reach me, you can email me at elizabethfuss@msn.com. 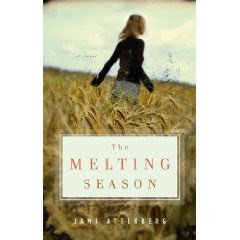 When I finished reading Jami Attenberg's The Melting Season, I felt it in my stomach. And my throat. With a suitcase full of money and a soul full of secrets, Catherine drives across the country in search of answers, closure and a new life. The story weaves its way through the past and the present with intricacy and depth. The characters are rich like good chocolate cake, with complex elements and beautifully human characteristics. It's a novel about sexual dysfunction, the evolution of a life and how the pieces all fall into place. It's heartbreaking. And beautiful. What I love about The Melting Season, is that it is a portrait of a whole person, broken parts, damaged soul, loving heart, all of it, told in lyrical thoughts and narrative, at times like poetry, at times like the simple words in my head, unembellished and honest. It's very intimate and I wanted to cry for Catherine and hug her and fight for her. So yes, when it was over, and I finished reading this fine book, I felt it. And I might have cried. A little. Or maybe a little more than a little. You can see the book trailer here. Buy it, check it out from the library, read it, love it. With the new blog rules from some government agency, I guess I have to tell you that I received my copy of The Melting Season from the publisher before its release. But I was a fan of Jami Attenberg's way before that when I read her essay in Alone in the Kitchen with an Eggplant and her book The Kept Man. And I wouldn't write about it if I didn't love it. And I did. Love it, I mean. Here is the latest project with my sister Chelsea on her blog, Frolic. 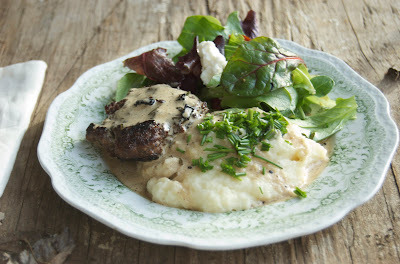 This recipe is lovely, wintery food with all the comfort and sauciness that food in cold weather requires. Cook potatoes in boiling water until tender, about 15 minutes. Meanwhile, brown the chorizo with the leeks and add the tomatoes. Cook over medium heat, stirring occasionally until the tomatoes burst. When the potatoes are done, drain and slice in half. Stir the potatoes into the chorizo mixture. Add olive oil and cook until potatoes are slightly browned. Add the vegetable stock, scraping the brown bits off the bottom of the pan. Cook over medium heat until the liquid is gone, about 5 minutes. Add kosher salt and pepper to taste, though you won't need much, if any, as the chorizo is fairly salty and seasoned well. 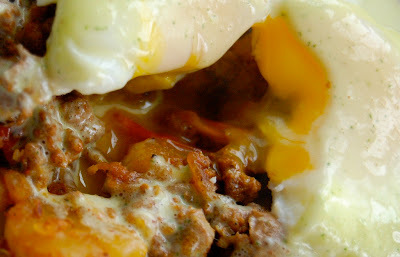 In a blender, add the egg yolks and the cream for the hollandaise. Blend on high until frothy and creamy. Add the cilantro and the lime juice. On the stove, in a small pan, melt the butter until bubbling, but not brown. Turn the blender on and slowly add the melted butter. Blend for about two minutes. Sauce will be thickened slightly. Set aside. In a skillet, add about two inches of water and bring to a simmer. Add a sprinkle of white vinegar and a pinch of salt. Add eggs one at a time (working in batches if necessary), and cover. Cook for about 3-4 minutes, until the whites are set. 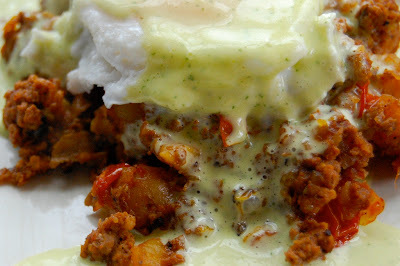 To serve, put poached egg on top of hash and cover with hollandaise. It was so easy when I was young to decipher bad from good. Adulterers are bad. Christians are good. Thieves are bad. Mothers are good. So easy. Then when I was in middle school, I met my grandfather - a feisty old man who diligently smoked, told us unbelievable stories from his Adventures in Life, and had more women than we could comprehend. He would call us drunk on Sunday nights while we watched The Wonderful World of Disney. "Hello, Miss America!" he would slur, as my sisters and I giggled. He was a philanderer, a storyteller, an alcoholic, a generous man with a big heart, a skilled poker player, a champion boxer. I told my best friend about him once and she told me it was "sad" that I had a grandfather like that. Was it? I remember thinking that I shouldn't love him so much because of his faults, but I couldn't help it. I didn't think it was sad. I thought it was interesting and a little exciting. 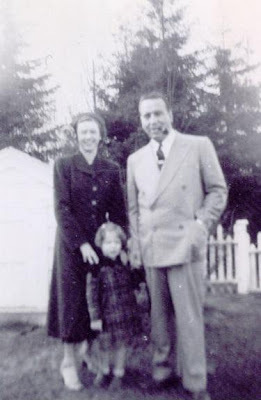 My mother felt differently about him, and rightly so, as his version of fatherhood left her and the rest of the family alone and distant, fighting for normalcy in their lives in the 1950s. She loved him, though, and kept him in our lives once we became acquainted with him. He was a good man. With lots of flaws. Some of them hurtful. Some of them endearing. All of them human. Don Draper, the central figure in AMC's Mad Men, is such a man. Easy to hate in the beginning, because of his constant sexual escapades and abandonment of his family. Then easy to love, as his character deepens, becomes enriched with secrets, history, pain and compassion. The traits weave together into one of the most complex characters I've seen on television. Played by Jon Hamm with a smoldering control of emotions, Don Draper is a hero and a villain in one. Just like my grandfather. Peggy, Don Draper's secretar y-turned-copywriter, similarly makes morally questionable decisions, making me cringe at times, cry at others. Her character, both pathetic and fierce, is stoic, showing almost no emotion, apparently outsourcing the task of feeling to the audience on her behalf. But there is something fighting within Peggy's character to get out - and while I was trying to figure out what that was, I became addicted to Mad Men. Or more accurately, I became addicted to the complexity of the characters. I could go down the list of all the characters, all shown in a very human light, and weigh their good and bad qualities to determine if they are good guys or bad guys. But why? With few exceptions, human beings are not exclusively good or bad. With no exception, human beings are flawed. Most people are doing the best they can with what they have to work with. Very few television shows embrace humanity with such richness. 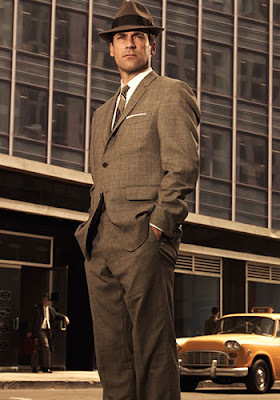 This show - Mad Men - is a beautiful show, no doubt you've heard. Beautiful people, beautiful sets, beautiful design. But the depth of the characters, the constant tug of war between good and evil within each person's soul, that is the most beautiful part of this show.